Hi everyone! 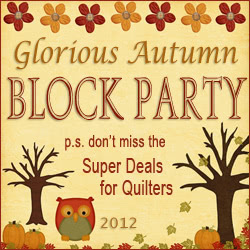 Welcome to Block 29 of our Glorious Autumn Block Party. Today we have Emily Breclaw as our featured designer and the Fat Quarter Shop has a fabulous Super Deal. Be sure to check out Emily’s give-away too! 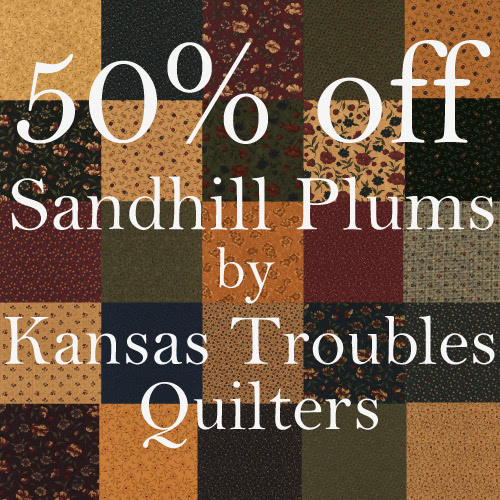 50% off Sandhill Plums by Kansas Troubles Quilters for Moda Fabrics! Use coupon code “sand” (no quotes). Ends Tuesday, November 14, 2012 at midnight CST! My sister and I started quilting in college. It all began with a magazine picture of a yo-yo quilt. We spent most of a Christmas break tracing circles with coffee can lids and cutting out fabric. Several years later, my sister had a beautiful pastel quilt that looked like a three-dimensional Grandmother’s Flower Garden, and I had a random quilt filled with colors that made me smile. I started my design business a year and a half ago, when I discovered a lack of interesting hexagon quilt patterns on the market. I wanted to help quilters progress beyond the notion that y-seams and hexagon quilts are too difficult to attempt. English paper piecing and hand piecing with Inklingo are two of my favorite methods. My favourite quilt is called Tumbling Snowflakes. I designed it in Electric Quilt for the Inklingo Love the Lines contest. When the design won, I made the quilt and created a pattern for it. Before this quilt, my designs were simple and small. This quilt, however, has over a thousand patches. With all of the great information on the web about hexagon piecing, especially from Inklingo, I had a ton of fun putting the quilt together. (Aside from hand-sewing one row in upside down, of course!) I love this quilt because it reminds me that I can create something wonderful, even if I only have time to sew a couple of seams each day. Favourite one-sentence tip for a new quilter: Quilt with a good friend and a pot of coffee! Here’s Emily’s block: Crown of Leaves. This block is completed with English paper piecing (EPP) and I must say, it’s calling my name. If you’ve never done EPP before, in addition to Emily’s tutorial, here’s a great series of videos on EPP with Hexagons that will help you to get started. Head over to Emily’s blog to download the tutorial here! See the previous free blocks here! Celebrate fall and English paper piecing with Emily’s popular Pumpkin Patches table runner. Leave a comment on on her blog for a chance to win a copy of the pattern and an assortment of twenty 2.5″ squares to get started on your own family of pumpkins.